Cameras start to roll today on the Belfast set of ‘Whole Lotta Sole’, a new feature form Oscar nominated Irish director Terry George (writer, Hotel Rwanda, In the Name of the Father) starring Brendan Fraser (Crash), Colm Meaney (Parked) and Martin McCann (The Pacific). ‘Whole Lotta Sole’ will shoot in and around Belfast from today, April 8th until mid-May. In the feature Yaya DaCosta (The Kids are All Right) plays Sophie, the girlfriend of Brendan Fraser’s Joe Maguire who, along with a baby and two ten-year old tearaways, are taken hostage in Maguire’s antique shop by Martin McCann’s young gunman, Jimbo who is being pursued by Colm Meaney's police detective Weller after a botched robbery at a Belfast fishmongers owned by gangland boss Mad Dog Flynn, played by David O’Hara (The Departed). 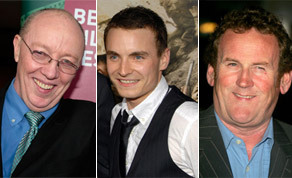 Produced by Generator Entertainment’s Mark Huffam (Killing Bono, Game of Thrones) the feature sees Des Whelan (Rogairi) on set as director of photography, David Craig (Kings) on board as production designer and Hazel Webb Crozier (Your Highness) working as the film’s costume designer. The film will be edited over the summer by Nick Emerson (Cherrybomb) and the film's soundtrack will be composed by Foy Vance (Golden Delicious). Speaking with IFTN earlier this week, IFTA winning lead actor Martin McCann voiced his excitement about the upcoming production of ‘Whole Lotta Sole’, saying: “I’m just really excited to get working with Terry George - even in my audition for the film I got a real sense that this is one director and writer with more talent in his baby finger than I have in my entire body! Budget information for the film is TBC but support funding has come from Northern Ireland Screen, Invest NI and the European Regional Development Fund.